Last time, we have dicussed the feature of LED flex circuit, and this time, we will mention the way to make that Flexible circuit. 1) The whole Flex circuit is the repeated of several section of FPC. So we can populate LEDs, as well as ICs, etc, on FPC. And then solder each sections together, strip-by-strip, to make a long flex circuit boards. After several strip of FPC is connected by soldering, or using connector, we will do testing and then packing them in a roll, normally 3 meter, or 5 meter. It should be packing in vacuum packing. 2) Just make the enough length single FPC one time, without the soldering connecting. This is used in some special end-products which obvious soldering is prohibitted and more strength is needed. Of course, this kind of FPC is more difficult to make, becuase of manufacuturing artwork & equipment limited. Right now, we can make, maximum 3 meter (118 inch) one. Of course, the cost is more expensive than method 1. Popular length is 0.8meter(31.5inch), 1.0 meter (39.37inch), 1.2 meter (47.25 inch), or 1.8 meter (70.87 inch). More long, more expensive, as the manufacturing will become more and more complex, and need high technology to control whole process, from developing, etching, coverlay lamination, outling punching. Sometimes, poeple like to cut the customized lenght at his side according to different requirement. so during design process, engineer will consider cuttable length such as 30mm, 50mm. This will give customer great convenience. How’s your opinion about them? Do you have any questions or problem when used this kind of FPC? Or want to try ours? Please don’t hesitate to contact BEST FPC CO., LTD. for more information about Flexible Circuits with LED (LED Flexible circuit boards). We are always to be your best parter of FPC in Asia. 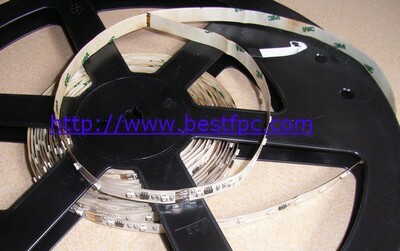 Recently, more and more people pay attention on the Flexible circuit with LED (or said LED Flexible circuit). Along with the FPC industry growing, as well as the LED application spread out, there’s continue request of precision lighting & luminescnce in some special circumstance. In fact, this Flexible circuit with LED is a special single sided fpc or two layers FPC, with adhesive tape at the bottom side, easy peel off and installation. The outstanding characteristic is its length. 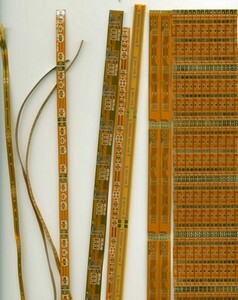 Theoretically, the length of this Flexible circuit can be made according to clients’ request. The popular maximum length currently used, however, is about 8-10 meter (2.5-3.0 ft), because of power and thermolysis limited. (Please browse our site for more: http://www.bestfpc.com/products/single-sided-fpc.htm, http://www.bestfpc.com/products/double-sided-fpc.htm). 1) Separable SMD/SMT LED strip on Flexible circuit boards can be bended to the tour of any products with self adhesive tape back, easy installation! 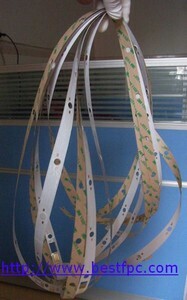 They are mounted on self-adhesive tape and can be conveniently field-cut. For adhesive tape, normally we use 3M 467/946/966, or as per request. 2) As long as the clients request (strip-to-strip soldered connecting). You can also choose our extreme long FPC which is 9.8 feet (3m) without soldering. 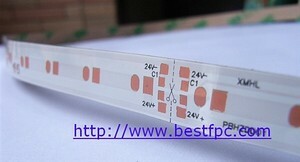 3) This flex circuit modules, after LED SMT/SMD were done, are ideal for edge lighting transparent and diffuse material. They provide an optimal solution for precise backlighting of complex contours. They can also be used of lifesaving/rescue sign lights and commercial signs and for making contours like escape routes, borders and stairs. 4) Customer design LED location, quantity, color (red, green, blue, true green, white (phosphor on blue), yellow, etc), according to the request of luminous intensity & color. 6). With IC constant current circuits, guarantee stable working current and even light output for the whole reel of lights.